In recent years, Cancéropôle Île-de-France has developed relations with Europe, the Americas, and Asia. Privileged relations have been established between Cancéropôle Île-de-France and the SIMZ (Shanghai International Medical Zone) and Washington State. An exchange of experiences around the structuring of genomics with the participation of English and Dutch experts was organised in Europe. Cancéropôle Ile-de-France also relays information regarding the 7th FPRTD. The visit of a Shanghai delegation, led by Mr Raymond Li, the Executive Director of Simz (Shanghai International Medical Zone) has allowed the Cancéropôle Île-de-France to consider future collaborative actions with China. 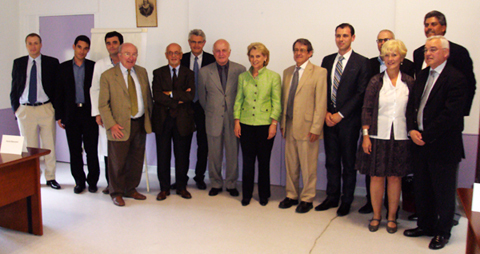 On the 22nd May 2011, Cancéropôle Île-de-France received adelegation of West Coast companies led by the Governor, Mrs Christine Gregoire. This first meeting was an opportunity to discuss the possibilities of implementing together international collaborations on cancer research. The seventh Framework Programme for Research and Technological Development (7th FPRTD) is the main instrument for European research funding the 2007-2013 period. It consists of four major programs whose vocations and modes of implementation are specific: capabilities, cooperation, ideas and people programmes. In this context, one programme in particular, Innovative Medicine Initiative (IMI), focuses on public/private partnerships.